Freediver Swims Underneath Frozen Ice Lake ... In a Speedo!!! 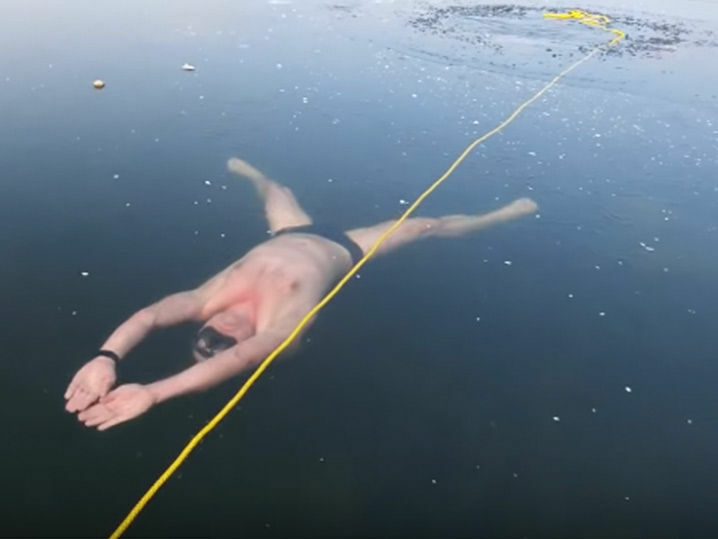 This is one of the craziest things we've EVER seen -- a 54-year-old freediver cut a hole in a frozen lake in the Czech Republic and swam under a sheet of ice ... IN A SPEEDO!!! The dude behind the stunt is Petr Kapoun -- and after watching this guy handle the cold, he looks like he could be part of the White Walkers from "Game of Thrones." Dude put a yellow string above the solid ice at Lake Milada in January to guide him along during his swim ... and it worked. He was able to get from frozen point A to frozen point B without a problem. Kapoun is a health freak -- aside from being a thrill-seeker -- and has reportedly credited his diet and strict workout regimen for the strength and focus to complete the frozen swim. So, what's next for Kapoun? Probably waiting for his balls to drop back out of his stomach. Someone get this dude some hot cocoa!! !